The firm HEYD is a 3rd generation family owned company, located in the heart of Germany. Here, amidst forests and vineyards, is where we called home. At 3 plants in Bietigheim-Bissingen, which is famous for its beautiful historical town centre, we produce steering and chassis parts for the automobile industry. At Öhringen, situated in the scenic hohelohe region, we develop and manufacture ball and socket joints, clevises and universal drive shafts. 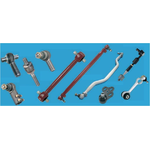 With a wide range of modern machines for all types of mechanical production processes HEYD presents itself as a supplier of mechanical components for commercial vehicles, passenger cars and also trains. Acquisition, as well as updating of customer contacts and information exchange. developers from domestic and abroad.